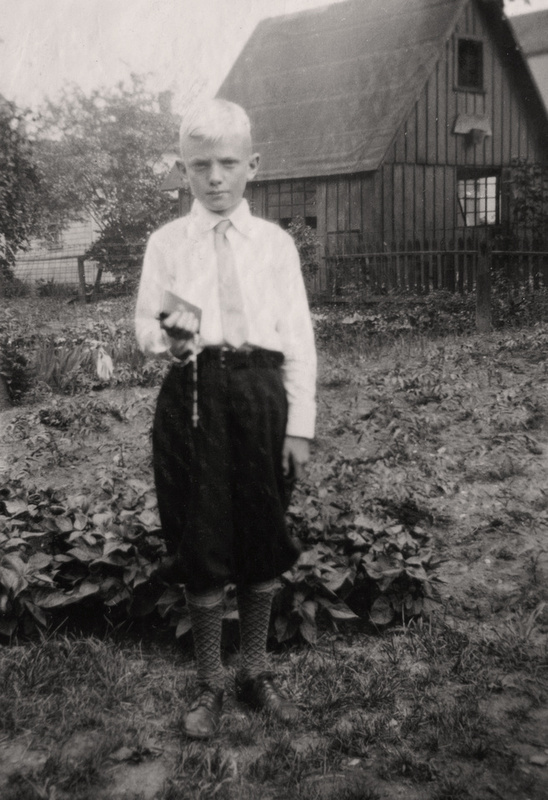 This photograph of Edward V. Murosky was most likely taken in Erie, Erie County, Pennsylvania where the family lived. The photograph may have been taken late spring or summer. Based on Edward's age the photograph would have been taken in the 1930's. Edward V. is dressed in a shirt with a tie. He appears to be holding a rosary and a prayer book. The photograph may have been taken the day of his confirmation. There is a second photograph of Edward standing with his mother Helen Tillie Bukowski that was taken the same day. From the Helen Tillie Bukowski Collection. These photographs were located in a small album. Photographer Unknown. Editing and digital restoration by Michelle M. Murosky. Helen Tillie Bukowski is my great grandmother. Edward V. Murosky is my great uncle. Helen's son Arthur Murosky is my paternal grandfather. Awesome blog! I like the way you have set it up so it is easy to find information. I started another blog this year with geneabloggers. I'm trying to keep up the other one as well but not doing real well at it. Hi Grant! Thank you for stopping by to visit and for the helpful feedback. I like to use the labels gadget to organize similar label types. Thank you for reading!